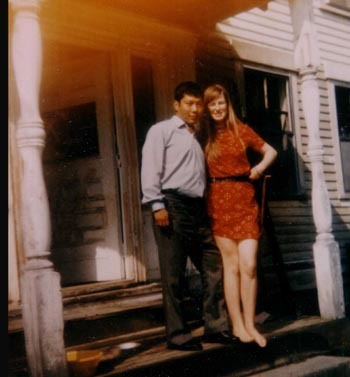 Chögyam Trungpa and Diana Mukpo at Tail of the Tiger, 1970 before the door was painted. 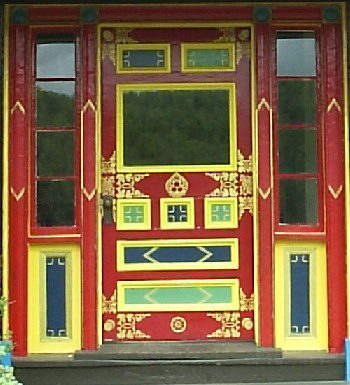 The front door to Karme Chöling as it looked in 1970 (after Jack Niland painted according Rinpoche’s instructions). Jonathan and Tamara Eric at the Stupa Consecration, August 2001. “I’m here to meet the man who wrote this book,” said Jonathan holding up his copy of Meditation in Action. Jonathan, who was a close and much loved student of Trungpa Rinpoche, died in October 2003. Here is an excerpt from a Chronicles interview from March 2002. For the complete interview and more about Jonathan’s life, visit A Tribute to Jonathan Eric. JE: Okay. Tail of the Tiger, summer of 1970. 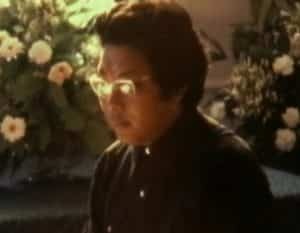 One thing I remember is that once a week during times when there were no programs, Trungpa Rinpoche would lead a meditation practice in the evening for an hour. He would sometimes, I remember, give a brief dharma talk as well. I remember him leading us in a minute or two of chanting the Vajraguru mantra at the beginning of the sitting. WF: OH AH HUM VAJRAGURU PADMA SIDDHI HUM? JE: Yes. So that’s one of the flavors. It was a very small shrine room, an upper room. We could squeeze in only about fifteen or twenty people at the most, I think. I don’t know specifically about the numbers, though. WF: Was it a guided meditation? JE: No, after the mantras it was silent for an hour. I think he had a little gong or something to signal the end. One day when I was there, I was hanging out on the front porch and Lady Diana came out. She wasn’t known as Lady Diana in those days; she was a sixteen-year-old girl who happened to be married to the guru. She came out and said to me, “You’re taking me down to the mailbox.” I said, “I am?” And she said, “Well, if you don’t mind.” So we got into my bus and we drove down to the mailbox—maybe a quarter of a mile to the end of the dirt road. She got her mail and came back. That’s the whole story. 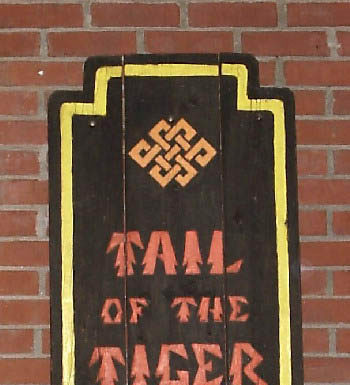 I think just about everybody at Tail of the Tiger in those days was very trippy. But there was one guy who even us trippy people considered trippy. He was a guy named Bob and he was on some sort of mucusless diet. So, naturally his name became Mucus Bob. So that’s all of that story. 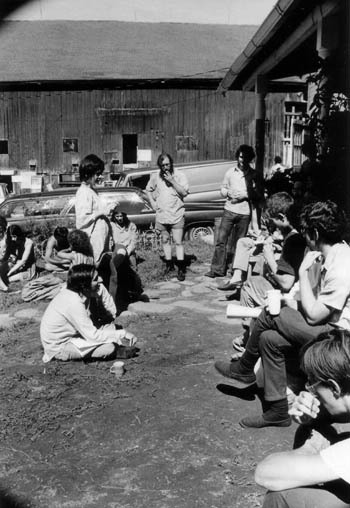 There was a community meeting in the living room, which was where the talks had been for the first seminar, The Jewel Ornament of Liberation. 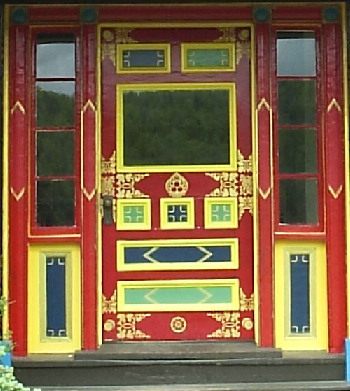 The second seminar, Four Dharmas of Gampopa, was held in a tent. But there was a community meeting and somebody proposed doing it in Native American style. There was a moderator, and everybody could have a say on the issue, whatever it was. There wasn’t any time limit to how long a person could speak or what they could say. The only restriction was they had to refrain from using the word “I” or “me.” If you referred to yourself, it had to be in the third person. There was no first person allowed. 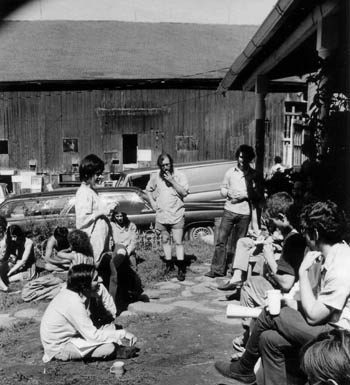 JE: They seemed to be agreed to by Rinpoche, proposed by some of the students, and sort of accepted by acclamation, more or less, “Let’s try it this way.” Trungpa Rinpoche asked me to be the moderator. There were a few people who had to be reminded not to use the first person. We got to Trungpa Rinpoche and he started saying some things, quite pointedly using the word “I” several times. I let him speak and come to his conclusion, and then I said, “The moderator does not wish to interrupt a person’s train of thought, but wishes to remind everybody that we are not to use the first person and that includes people from Tibet.” We went around some more and then concluded the meeting. After everybody had had their say, I thought that the meeting was over so I started making some comments using the first person myself and got called on it. 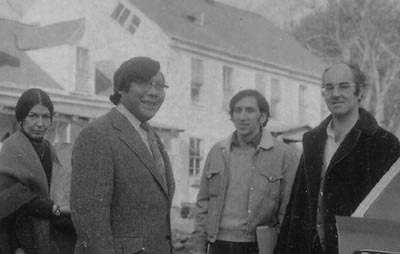 But then after the meeting Trungpa Rinpoche complimented me by saying I was a good moderator—I think he used the word “great”—and we were just hanging out with him in the dining room, which was a slightly smaller room next to the living room. And I remember he was wearing my hippie hat. It was a black hat, sort of somewhat floppy, that I’d put a red bandana around, and he was wearing that hat and just goofing around. So that’s that story. Another time at Tail of the Tiger that summer, Polly Monner (Polly Wellenbach now) and I took our guitars and drove in my bus a little ways down the road to the mailbox and turned off on an old track and drove up to a sort of flattish place, and were playing guitars. I think there were probably one or two other people with us. We both were into sort of bluesy type music. We were playing and it was evening, beginning to get a bit dark, as I recall, and at a certain point a car came down the driveway and Trungpa Rinpoche got out of the passenger side and he looked up to where my bus was and where we were sitting there with our guitars. His face brightened and he began limping up the path. But when he got up to where we were, he looked at each of our faces. From my point of view, I was kind of seeking some relief … from these teachings … somehow. And maybe Polly felt the same way, I don’t know. But he looked at each of our faces in turn for a moment, and his smiling countenance immediately went to neutral, and he turned around and walked down to his car. So I just thought that was an informative story, that it was a learning experience for him as well, that he could no longer hang out with everybody or something like that. I don’t know precisely, but I always thought about it that way, that he was no longer exactly one of the gang. This was the summer of 1970. 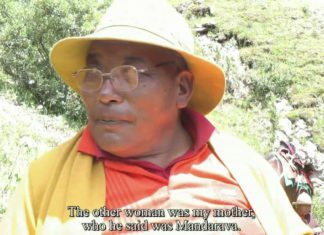 It was less than two years since he had received the Sadhana of Mahamudra. It was about a year since he had gotten married and somewhere in those two previous years he had decided to give up his robes. And so I think he was just in a learning curve for himself at that point. 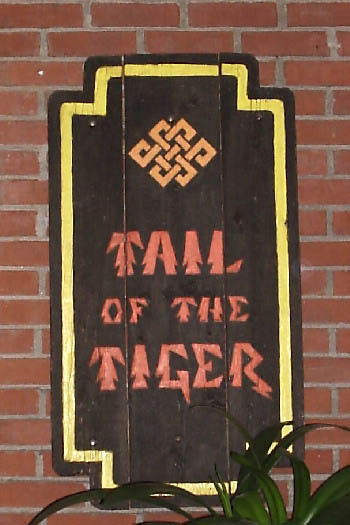 JE: Another topic: Food at Tail of the Tiger. I remember lots of buckwheat and turnips, cooked turnips. I remember those, because I’d never eaten any buckwheat or any turnips before then, and I found both of them sort of difficult, shall we say. It was all vegetarian at that point. I assumed that was his students’ choice rather than his. And I remember that we always did an offering chant before meals. I don’t remember the precise chant but I recall that it was the Jigme Lingpa feast chant, which I think is rather famous and well known. I don’t know anymore about it than that. But somebody such as Tanya or Fran might remember precisely what it was. Next topic: I was hanging out at Rinpoche’s house in Four Mile Canyon and I remember one day he came limping over to me and said, “Jonathan, I think you should be a monk.” I had thought about that myself during my long retreat the year before and I said, “But I’d never be able to keep the precepts.” And he said, “Maybe, later.” And I said, “Maybe later.” As an addendum to that, in 1999 I had a brief audience with Thrangu Rinpoche where I told him that story and I asked for his blessing so that I would be able to be a monk in my next life. WF: Is that a question that has stayed with you through the years, whether or not to take vows? JE: Yeah. Yeah, it has … very much so. At another time in Boulder when I was Trungpa’s interview scheduler, there was an occasional wedding that he performed with me there. One day after a wedding – I don’t remember whose wedding it was – he looked at me and said, “You’re next.” And I said, “I wouldn’t mind getting married if I could find somebody who liked me that I liked.” And he said, “For how long? Ten minutes? Ten years?” I didn’t have an answer for that. [Chuckles.] So later I got married and we had two children, a boy and a girl, who are both in Boulder High right now. JE: Yeah. Yeah, I even wrote a song about it. It’s better with guitar, but I can’t play guitar anymore, so if you don’t mind I’ll sing it. JE: So, he enjoyed that. WF: [Laughing] That’s great Jonathan. JE: That was sort of near the end of my tenure as his interview scheduler.